The 2019 NBA Playoffs continue on Sunday with four Game 4 matchups on the schedule. The day begins when Kyrie Irving and the Boston Celtics (-2.5) and their 3-0 lead take on the Indiana Pacers at 1 p.m. 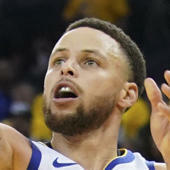 ET, followed by Steph Curry, Kevin Durant and the Golden State Warriors (-8.5) taking a 2-1 series lead into a showdown with Lou Williams and the Los Angeles Clippers at 3:30 p.m. ET. In the evening, Aaron Gordon and the Orlando Magic host Kawhi Leonard and the Toronto Raptors (-5.5) down 2-1 in their series at 7 p.m. ET, then Russell Westbrook and the Oklahoma City Thunder (-6) look to even the series at home when they host Damian Lillard and the Portland Trail Blazers at 9:30 p.m. ET. Fans across the nation will be placing wagers on these NBA odds, but before making your own NBA picks, you'll want to see what the best NBA best bets from SportsLine data scientist Stephen Oh. The renowned co-founder of Accuscore, Oh uses a data-driven approach to crush sportsbooks. Now he's crunched the numbers for every Sunday NBA matchup. SportsLine's top-ranked NBA handicapper is on a sizzling 90-70 run on NBA picks heading into the weekend, returning nearly $1,400 to $100 players in a short period of time. Oh has found three lines worth playing Sunday -- if you parlay them, you could be looking at a sweet 6-1 payout. We can tell you Oh is backing the Pacers (+2.5) at home against the Celtics at 9 p.m. ET. Oh has nailed 10 of his last 14 picks involving Indiana or Boston. While Indiana is not known as a high-scoring outfit, it's suffered a major power outage this series. The Pacers are averaging a miserable 87 points per game, including a brutal 74 in a Game 1 loss at Boston. The good news is the Pacers also have the NBA's top-ranked defense, and it's held down the Celtics to just 95.7 ppg, 10 points under their season average. Oh's computer model projects six players scoring in double figures for Indiana, as the team effort overcomes early struggles. The Pacers not only cover in a majority of Oh's simulations, they win straight-up over half the time. "The Pacers have yet to score triple-figures in a game this series. Eventually one would think things even out, and my projections say it's Sunday," Oh told SportsLine. Confidently lock in the Pacers to cover, and you could be well on your way to a colossal parlay payoff. Oh's computer model is also projecting a big cover from another underdog Sunday. Find out everything else you need to know to complete your NBA parlays over at SportsLine. So which Sunday NBA picks should you back for a shot at a huge 6-1 payout? And which underdog is in position to cruise to an easy cover? Check out Sunday's NBA schedule and odds below, then visit SportsLine now to get Sunday's NBA best bets, all from the renowned data scientist on a massive 90-70 NBA heater. Celtics at Pacers (+2.5), 1 p.m.
Warriors at Clippers (+8.5), 3:30 p.m.
Raptors at Magic (+5.5), 7 p.m.
Blazers at Thunder (-6), 9:30 p.m.